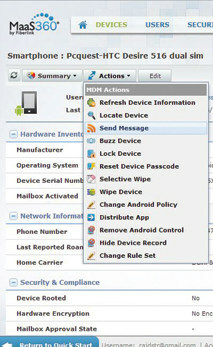 MDM functionality typically includes over-the-air distribution of applications, data and configuration settings for all types of mobile devices, including mobile phones, smartphones, tablet computers, ruggedised mobile computers, mobile printers, mobile POS devices, etc. By controlling and protecting the data and configuration settings for all mobile devices in the network, MDM can reduce support costs and business risks. Step1: First go to www.maas360.com and register for a free trial for 30 days. Once you register it gives you the option to choose your device. 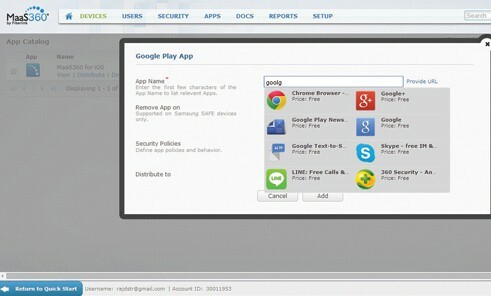 In the example, we have enrolled an Android device. Click on start and it will open a window where you have to fill some user details. Step 2: Once you fill in all details, it will send a request to the user’s mail ID for enrollment with a pass code with a Corporate Identifier. 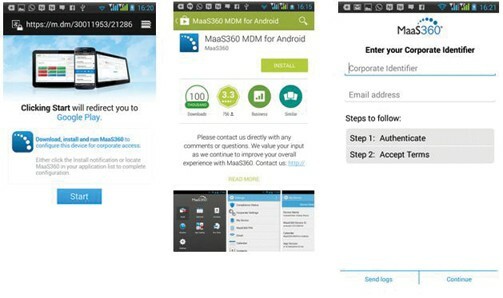 Step 3: Now, you will have to open a device enrollment link which shall download the MaaS360 app from GoogleStore. Once it is installed, it will ask for Corporate Identifier code which you got in your mail. Step4: Once your installation is complete, your device will be successfully enrolled with MaaS360. 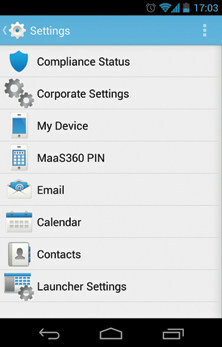 In this app you get several options like compliance status, cooperate setting, device information etc. Step5: On quick start interface it will show that your device is enrolled successfully and its status. Close the quick start button. 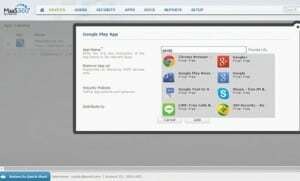 Step 6:Once you click on close quick start button you will see it shows your admin webportal page of MaaS360. In the dashboard you get complete information, how many devices are enrolled, whether iPhone is jailbroken or Android is rooted, etc. Step 7: Click on Device options and select your device. It will show complete information of your device. Step 8: Click on the Action option where you get all options like Locate device, Lock device, Wipe device, Distribute app, etc. Step 9: You can remotely push and install any app to the enrolled device. Just click on the app and a window will open which will directly link you with the Play Store. Step 10: Here, we show how the Locate device feature works. 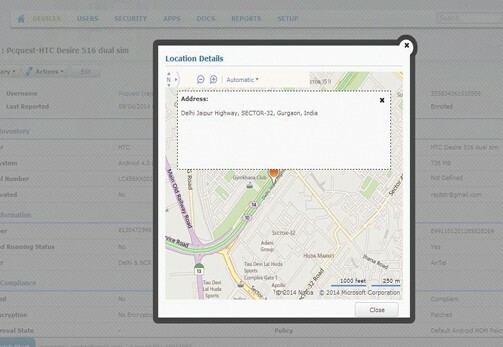 In the given screenshot you can see it perfectly traces our location and fetches the phone location address from Google Maps.